Santorini is unrivalled as the most photographed island in Greece. It is the face of Greece to the rest of the world. The island’s cubist white buildings, its pastel coloured doors and windows and the blue domes of its churches are the basic ingredients of picture-postcard Greece. Those blue domes complement the blue skies and blue seas that decorate so many postcards, calendars, coasters, fridge magnets and CD albums that tourists bring home with them. They are sometimes the first images that captivate potential visitors when they are dreaming about and planning a package holiday in Greece. And when those tourists return home, these calendars and posters decorate their homes as a reminder to return again. In the rectory in Askeaton, I have a number of prints of photographs by Georges Meis, whose work in Santorini is celebrated in so many of those calendars, posters and coffee table books. His exceptional photos of stunning Greek island scenery, especially Santorini, Mykonos and Crete, are easy to recognise and have been reproduced on thousands of postcards and other souvenirs sold throughout Greece. He captures the colours of Greece, particularly the blue domes, doors and windows and white walls in images that have become almost every tourist’s stereotypical image of Greece in the mind’s eye. In Dublin, I have prints of two paintings by the artist Manolis Sivridakis that continue to remind me of all the sounds, sights, tastes, smells and thoughts of a sunny Sunday afternoon in Santorini almost 30 years ago. The other ways lingering memories of a summer holiday on a Greek island holiday are brought back to life for the sentimental tourist include listening to those CDs – and finding Greek food on the supermarket shelves. 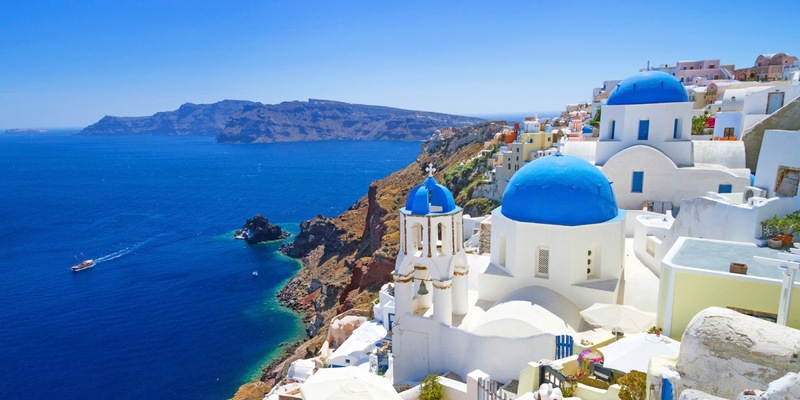 The Eridanous range in Lidl is packaged and marketed with those white cubist buildings and blue domes that instantly transport you back from the grey days of autumn in Ireland to the blue-and-white days of summer in Greece. Prominent in all of those packaging images – on tins, bags and cardboard packages – is the dome of the Anastasis Church, the most photographed church and the most photographed building on the island of Santorini. Greek history, culture and landscape have been airbrushed away by the very people who claim they are marketing a taste of authentic Greek living. The Eridanous range includes Greek olive oil, honey, moussaka, honey, yogurt, gyros, butter beans and pastry swirls, all on sale in their photo-shopped packaging in Lidl outlets in Ireland. I was first altered to this story at the weekend by a Facebook posting by Damian Mac Con Uladh, an Irish journalist and colleague working in Corinth and Athens. He drew attention to a news report last Thursday on the website Keep Talking Greece, which covers Greek news in English, says these products are sold across Europe. A German Lidl spokesman was reported as saying: ‘Our intention has never been to shock. We avoid the use of religious symbols on our packaging to maintain neutrality in all religions.’ Yet, religiously-neutral Lidl sells Halal meat products that feature minarets ... diversity and pluralism that we all ought to appreciate. In other words, in non-PR speak, Lidl believes the fault lies with false perceptions. The people who are providing a perception of Santorini that is different from reality are the people who have airbrushed the landscape and history of Santorini. Of course, I would prefer to buy real Greek yogurt rather than Greek-style yogurt. But could I buy it in real Greek packaging rather than imitation Greek-style packaging, please? Concluding his three-part series on the Reformation, Patrick Comerford looks at Martin Luther and his legacy today. In a recent feature in The Guardian, the Irish-born historian Dr Christopher Kissane wrote about the 500th anniversary of the Reformation and Martin Luther posting his ’95 Theses’ in Wittenberg on 31 October 1517. He points out that this anniversary is ‘as an opportunity for reflection’ and ‘a chance to heal old wounds.’ So, as this series concludes, it is appropriate to ask: What did Martin Luther achieve? And what is his legacy? 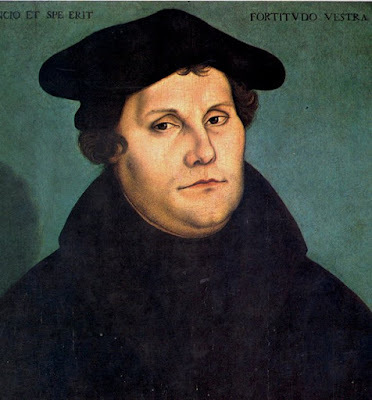 Luther’s theological insights are often summarised in the ‘Three Solas’ or the ‘Five Solas’: Sola Scriptura (the Bible alone); Sola Fide (Faith alone); and Sola Gratia (Grace alone); to which some add Solo Christo (‘through Christ alone’) and Soli Deo Gloria (‘to the glory of God alone’). However, much of what is accepted as Lutheran theology, including the Augsburg Confession, is the work of Luther’s more intellectual contemporary Philip Melanchthon (1497-1560). The Three Solas were not identified systematically until the 20th century, and the Five Solas are not listed together until 1965. In his approach to Scripture and Faith, Luther challenged centuries of theological consensus in the Church, East and West. Until Luther, Faith was understood not as individual assent but as the Faith delivered to the apostles, preserved in the Church and expressed in the Creeds. But his emphasis on individual faith, conscience and interpretation made an insightful contribution to the Enlightenment. Luther rejected the centuries-old consensus on the canon of Scripture. He relegated many canonical books of the Old Testament to the Apocrypha, and tried to remove Hebrews, James, Jude and Revelation from the New Testament because they challenged his views on Sola Gratia and Sola Fide. His followers rejected these proposals, but they changed the order of the books, which remain last in the German-language Luther Bible. Did Luther try to shape the Bible to fit his theology rather than allowing the Bible to shape his theology? Luther’s translation of the Bible was completed in 1534. It helped to standardise the modern German language, was a landmark in German literature and contributed to shaping German cultural and national identity. Luther’s cultural legacy is also found in the arts, including church architecture, painting and music. 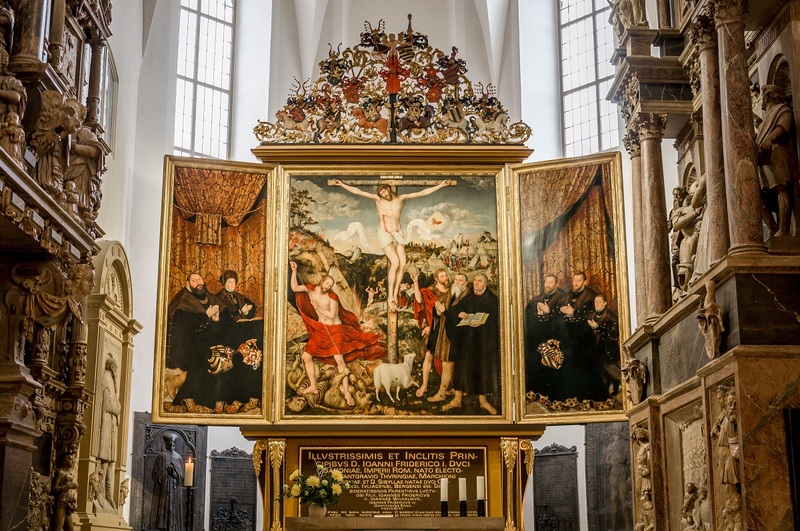 The altar pieces in Wittenberg and Weimar are among the great works by Lucas Cranach (1472-1553), who also painted the best-known portrait of Luther. His contemporaries included Matthias Grünewald (1470-1528) and Albrecht Dürer (1471-1528). Luther was a prolific hymn-writer. His best-known hymn is ‘A mighty fortress is our God,’ and many of his hymns were set to music later by Johann Sebastian Bach (1685-1750). But the ugly, unacceptable side of Luther is his antisemitism. His virulent anti-Jewish writings helped shape German, European and Christian expressions of anti-Semitism. His views informed the foundation for Nazi attacks on Jews in the 1930s and 1940s. Diarmaid MacCulloch says Luther provided a blueprint for the Kristallnacht, when Lutheran bishops applauded the burning of synagogues on Luther’s birthday, 10 November 1938. On the other hand, one of the towering figures of the 20th century was Dietrich Bonhoeffer (1906-1945), the Lutheran theologian who died in a concentration camp for his resistance to Hitler and the Nazis. Since 1930, there has been full communion between the (Lutheran) Church of Sweden and the member churches of the Anglican Communion. The contacts maintained by Bonhoeffer and Bishop George Bell through Swedish mediation laid the foundations for the World Council of Churches. Today, there is full communion between the Anglican churches in Europe and the Episcopal Lutheran churches through the Porvoo Communion, which brings together 15 churches. There are similar agreements in the US and Canada. Luther’s primary demands were for an end to Church corruption, particularly in the abuse of Papal authority and the ‘sale’ of indulgences; the administration of Holy Communion under both forms of bread and wine; access to the Bible in the common language; and an end to compulsory clerical celibacy. In recent decades, the Vatican has resolved most of these debates, including even clerical celibacy, albeit in a limited and restricted way. But many of the later divisive dogmas were not key issues at the Reformation, including the Immaculate Conception (1854), Papal Infallibility (1870) and the Assumption (1950). 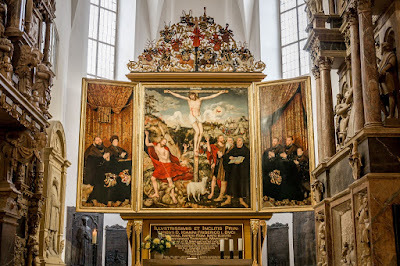 In 1999, the Lutheran World Federation and the Roman Catholic Church issued the Joint Declaration on the Doctrine of Justification, agreeing on Justification and lifting Roman Catholic anathemas that once applied to Lutherans. The declaration followed earlier affirmations of a shared, common faith, including the declaration on the Eucharist (1978). Pope Francis has recently spoken favourably about the process, but there is some way to go before the divisions of the past five centuries are healed.